Devour the multicultural history of Spain with a 4-hour daytime walking and gastronomy tour through the historic city center of Madrid. Visit 7 tasting stops including a century-old bakery and a family-run tavern serving the best Spanish omelette in town while weaving past the city’s emblematic sites. Discover the true culture of Madrid through your tastebuds with 11+ food tastings and 4 beverages, enough for a breakfast and hearty lunch. Meet your expert English-speaking guide in the historic Plaza Mayor and discover the story behind this emblematic square dating back to the time of the Habsburgs. Then awaken your taste buds with a steaming cup of sinfully delicious hot chocolate. Venture on to taste Madrid’s most classic cocido stew from a 100-year-old kitchen. Take the ham challenge with a blowout tasting of three types of cured Spanish ham (including the world-famous acorn-fed Iberian jamón) and meet the local vendors behind each family-run eatery. 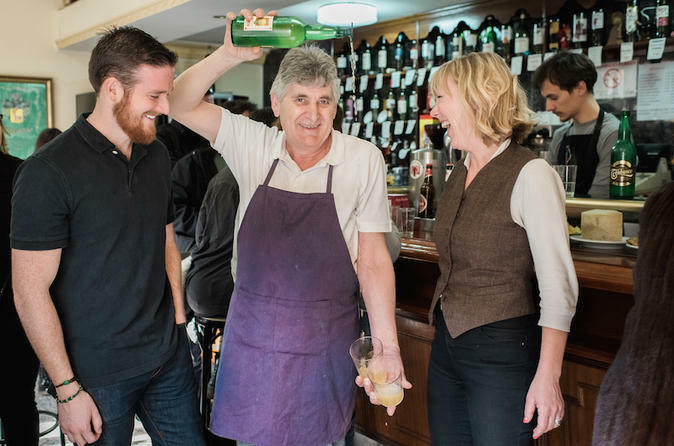 Savor the city’s best homemade Spanish omelette and wash it all down with famous Rioja wine, as well as local Spanish vermouth on tap and hard cider from the north of Spain (which you’ll learn how to pour the local way!). These are just a few of the 11+ tastings served during this tour! Between bites discover emblematic Madrid sites such as the Royal Palace, the Plaza Mayor, and the Plaza de la Villa as well as lots of lesser-known corners of the historic center.